Did you see the Total Eclipse of the Moon last night? TOTAL LUNAR ECLIPSE: 8/10/2014 (from 7:45-11:55 pm. 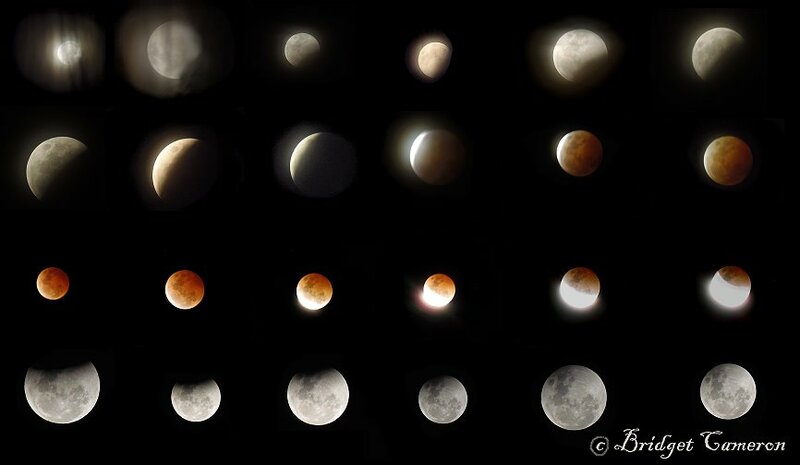 Adelaide Time): My photographic compilation of the lunar show! The evening started off cloudy, but fortunately the clouds dissipated and I managed to get some excellent shots! The Moon does not have its own light, but shines because its surface reflects the Sun’s rays. A total lunar eclipse occurs when the Earth’s shadow blocks all the Sun’s light from directly reaching the Moon’s surface. Eclipses of the Moon happen when the Sun, Earth and Moon are aligned to form an almost or exact straight line. The technical term for this is syzygy, which comes from the Greek word for being paired together. Why does the Moon look Red? The Earth’s atmosphere, removes or blocks parts of the sunlight’s spectrum leaving only the longer wavelengths. Because of this, a totally eclipsed Moon usually looks red. A lunar eclipse can also be yellow, orange, or brown in color. This is because different types of dust particles and clouds in the Earth’s atmosphere allow different wavelengths to reach the surface of the Moon. A total lunar eclipse usually happens within a few hours. Totality can range anywhere from a few seconds to about 100 minutes. Penumbral eclipse begins: This begins when the penumbral part of Earth’s shadow starts moving over the Moon. This phase is not easily seen by the naked eye. Partial eclipse begins: The Earth’s umbra starts covering the Moon, making the eclipse more visible. Total eclipse begins: Earth’s umbra completely covers the Moon and the Moon is red, brown or yellow in color. Maximum eclipse: This is the middle of the total eclipse. Total eclipse ends: At this stage, the Earth’s umbra starts moving away from the Moon’s surface. Partial eclipse ends: The Earth’s umbra completely leaves the Moon’s surface. Penumbral eclipse ends: At this point the eclipse ends and the Earth’s shadow completely moves away from the Moon.